Now that it’s too cold to swim or go tubing in Deep Creek, that’s no reason to stay away. The area’s three sparkling waterfalls are a treat any time of the year, and you can see them all in an hour’s walk from the trailhead parking lot. Because they’re on the main trail, Tom Branch Falls and Indian Creek Falls are the most-visited. But if you follow the short quarter-mile uphill trail to Juneywhank Falls, you’ll be rewarded with a beautiful 80-foot cascade, a quiet out-of-the-way spot that has inspired numerous wedding proposals. Deep Creek is one of the most accessible areas of the Great Smoky Mountains National Park, just two miles north of Bryson City. For more information on these and other area waterfalls, visit the Bryson City online visitors guide, GreatSmokies.com. 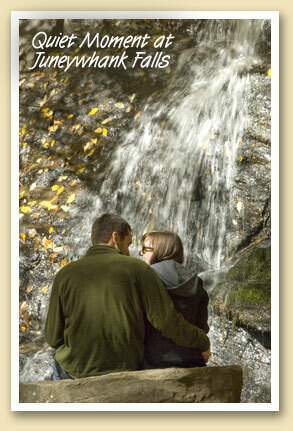 Download a printable PDF map of Deep Creek’s trails and waterfalls.